A great storyline with extremely addictive new gameplay and numerous extra features in this classic style matching game with a dazzling new twist. If you like this free game, try Call of Atlantis: Poseidon. Embark on a journey around ancient Greece, Babylon, Carthage, Egypt and Rome in the search for one of the greatest mysteries of all time - the lost city of Atlantis. 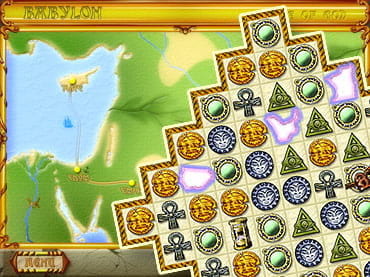 In this classic style matching game with a dazzling new twist you will need to discover pieces of ancient artifacts that will help you find a way to your destination. Download free full version game and start your journey! Free Game Features: - A dazzling new take on the classic style matching game; - Great storyline; - 76 mind-blowing levels; - Exciting power-ups; - A daring quest across the ancient lands of the Mediterranean. If you have questions about Atlantis Quest game, please contact us using this form.